I received this yarn from Lion Brand. This post may contain affiliate links. 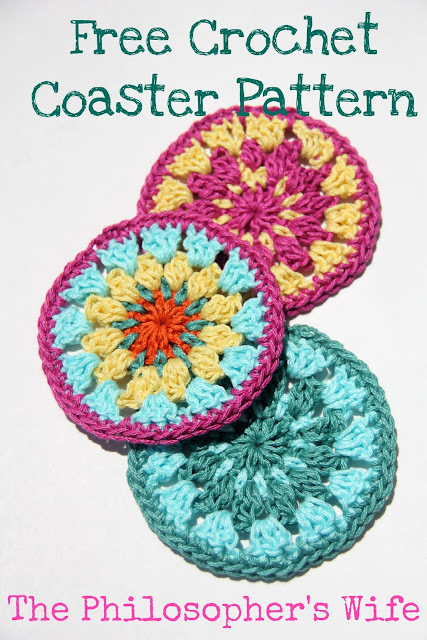 Coaster are a great crochet project. 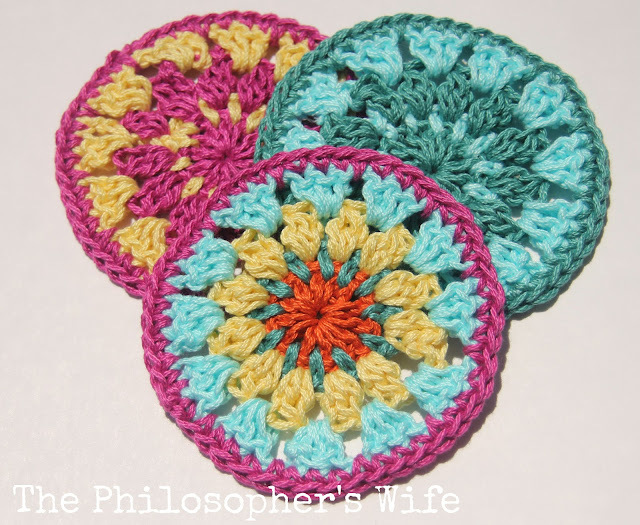 The are satisfying to make because you can whip a couple up in no time if you're an experienced crocheter, but even if you're a beginner it shouldn't take too long to have a completed project! They're also perfect for trying out new stitches and techniques, since they're so small. Lion Brand provided me with some of their 24/7 Cotton Yarn for these coasters. 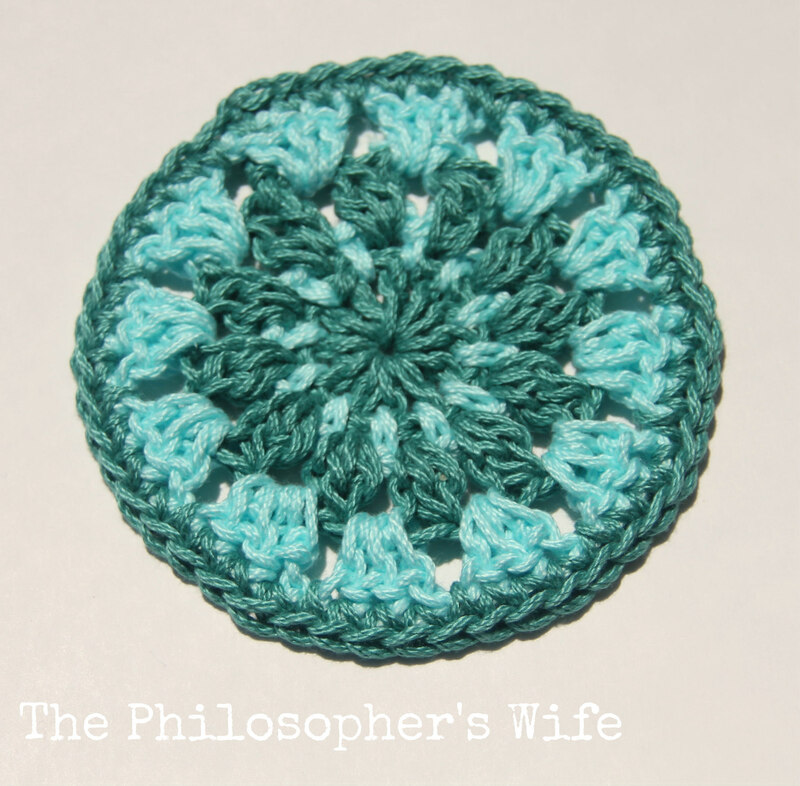 It's available in 24 beautiful colors and the mercerized cotton should hold up very well to lots of use, which is ideal for coasters! I personally found this medium weight yarn to be an absolute pleasure to crochet. With 186 yards I have plenty for a plethora of coasters, or a couple of other projects. The yarn is very soft and has a great sheen to it. I also really love the way that this yarn is constructed; it's not constantly splitting like many other cotton yarns. Have you used this yarn yet? I used the recommended crochet hook size for this yarn, which happens to be a G Hook. This cluster is done as follows: Make 3 half-complete double crochets into the chain one space, leaving the last loop of each stitch on the hook. Yarn over and draw a loop through all 4 loops on the hook to complete the cluster. 6. Single crochet in each stitch and chain one space. Fasten off, weave in those tails, and enjoy! 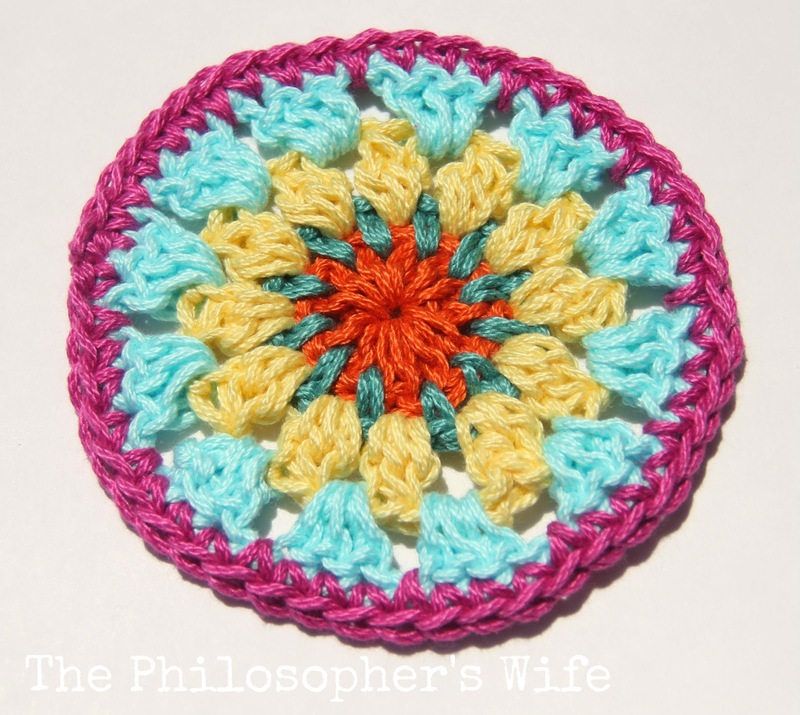 The five colors I used in this coaster are: Tangerine, Jade, Lemon, Aqua, and Rose. I will admit, I really, really, really dislike weaving in the tails at the end of a project. While I love all of the color in the above coaster, I also think this crochet pattern is really pretty with just two colors -- and I was just able to carry the yarn up to the next row for many fewer tails! This one uses Aqua and Jade. This one uses Lemon and Rose. 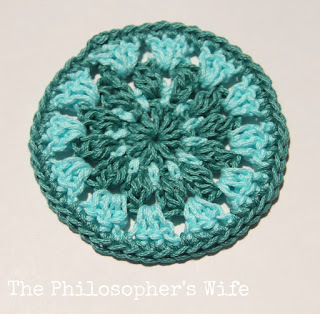 I hope that you like this free crochet pattern! If you make any coasters using this free pattern feel free to share them on my Facebook Page, or tag me on whatever social media you use! I'm also on Instagram, Ravelry, Pinterest, and Twitter. 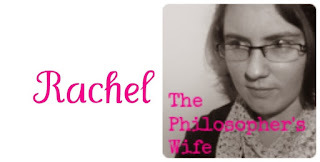 I love linking up with these bloggers! 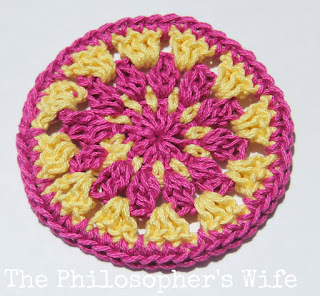 Super cute pattern... Love the bright colors! These might make a cute gift to include in a basket for our neighbors at Christmas time. I usually put together some type of beverage (coffee, tea, etc.) with mugs and a little snack. This will make the perfect addition. Thank you sharing! I love these!!! Great color combos, too! Thank you for sharing with #FiberTuesday link party. I hope to see you again this week! These are so cute. I've been wanting to try Lion Brand 24/7 yarn - I think this is the perfect pattern to try it on. Cute! I bought all the 24/7 my Meijer store had when they put it on clearance, so will have to make some.